The building of ‘Big Manege’ was constructed in 1817 under the order of Alexander I to celebrate the fifth anniversary of victory in 1812 war. It took eight months to complete this construction designed by Agustin Betancourt and executed by a special group of engineers and architects subordinate to a Moscow chief inspector of hydraulic and land works Major General Lev Karboniye. Back then the building used to be called an ‘exercise house” (house of military exercises). It is hard to say that everything went smooth with the construction. The idea offered by Betancourt and implemented by Karboniye presupposed a unique technological principle: exclusive roof rafter construction bridging the area of 44.86 meters without any intermediary supports. However, Manege’s two trussed rafters cracked in hot end July 1818. They were fixed but the following year they were damaged again. By the highest command of Alexander I the rafters had been rebuilt from September 1823 to May 1824 and their number increased from 30 to 45. In August 1824 Manege roof was finished with a ceiling. The machinery wonder of empire-style times was the result of joint contribution from many architects. Betancourt’s and Karboniye’s ideas were executed by honest and modest professionals almost forgotten: Colonel R.R. Bausa, engineer lieutenant A.Y. Kashperov and other. 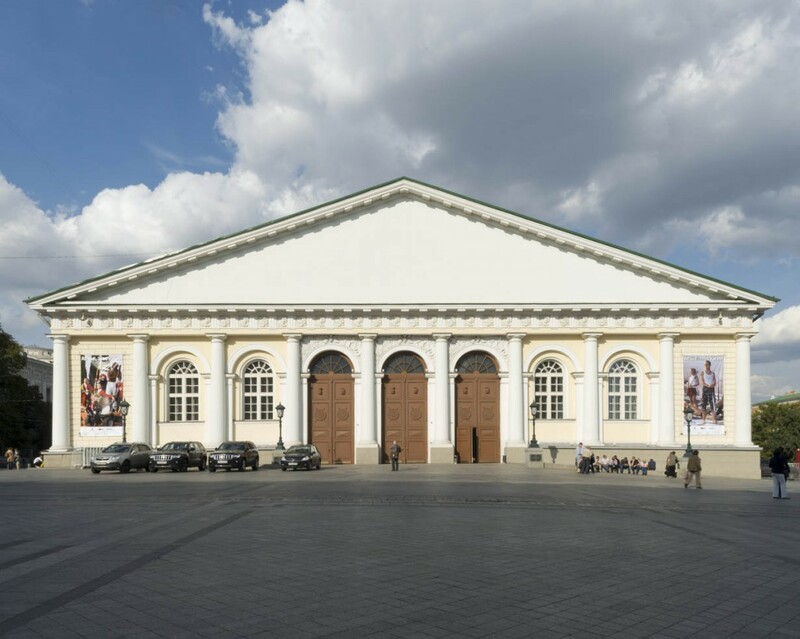 A known Moscow architect Joseph Bové, a chief architect of the Commission for buildings, finished Manege with stucco and plaster moldings in 1825. Since 1831 Manege has been hosting regular concerts and entertainments. After the revolution, it became a government garage and at the time of Nikita Khrushchev (since 1957) a Central Exhibition Hall was opened in the building. Sergei Petrov, a researcher who had been studying the Manege construction as a head of USSR General Office for Memorials Protection, told an interesting fact. In order to preserve wooden constructions at Bové’s times all attic was covered with wild tobacco, half-meters deep. All possible pests and insects hate its smell. Although the tobacco was completely consumed during the war 1941-1945, all constructions even in the 70ies of 20th century were as brand new. And even then the attic had severe tobacco smell. This tobacco fact brings in a nice trace of cultural associations. The associations primarily are connected with the history of domestic architecture. Makhorka! (‘wild tobacco’ in Russian). Today saying this old-fashioned word in Russian we cannot but mention the symbol of transformations in modern Moscow – Gorky Park which hosted the first All-Union Agricultural Exhibition in 1923. A ‘Makhorka’ pavilion built by a young architect, Konstantin Melnikov, became a first example and symbol of avant-garde forms creation for the generations to come.